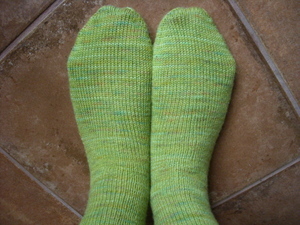 I managed to finish these, what turned out to be Paddy's Day socks, last night with only a couple of hours to spare. 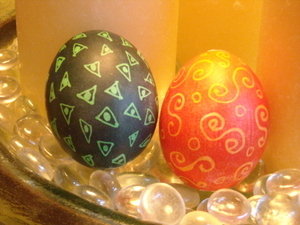 I hadn't intended them to be for St. Patrick's Day which we don't even celebrate, but it just worked out that way. These are the plain vanilla, top down sock recipe found in the Yarn Harlot's book, Knitting Rules!, with an eye of partridge heel. These will be perfect in my Birkies for the coming spring days. It's the first time I've done this heel and I love the look of it. I'm still deciding if my favorite sock is top down or toe up though. I'm going to start another plain vanilla pair and I think I'll do these next ones toe up. Specs: Dream in Color Smooshy, colorway Spring Tickle. 64 stitches on 2 size 1 Addi lace circs. I have a good portion leftover so I wish I'd made these longer. 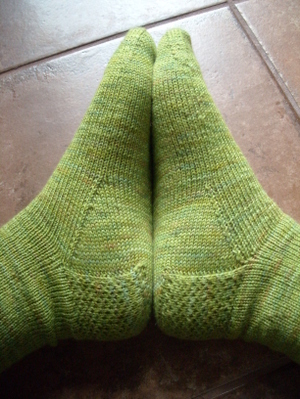 They are 7 inches to the top of the heel flap, but I could've added a couple of inches to the height. Smooshy is a superwash merino with 450 yds, very generous for sock yarn. I've been down with the flu since last Thursday which is why this is all I have to show for myself. I did get quite bit of reading done, but I'm still too tired to head into the studio for sewing. I also watched some movies including Rivers and Tides, which came recommended by Kathy at Pink Chalk Studio. If you've never seen Andy Goldsworthy's work, you have to see this film- awesome! Nasty flu! Just when I was planning on celebrating. Now I can't wait to be all better and really go out somewhere! Thanks for all the well wishes on completing my radiation. I'm thrilled to be "on the other side"! I've been sewing up a storm here. 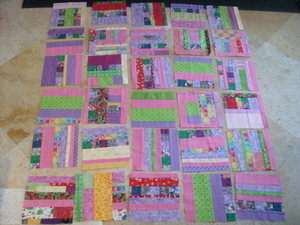 The pink string quilt is making good progress. It still only has two borders, but maybe I'll get the other two on soon. 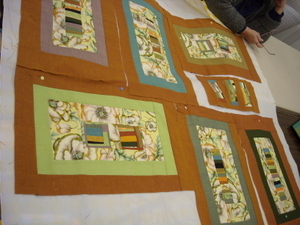 I'm hampered in finishing this one because I need batting, backing and binding for this community quilt. Today was my guild's community quilt day and I had planned to get down there and pick up the necessary supplies. Unfortunately, I came down with a nasty cough and fever and I didn't want to infect all the ladies. So, it may be a month or two before this one is finished. Here's a close-up. I like how the red sets off the pink and purple. 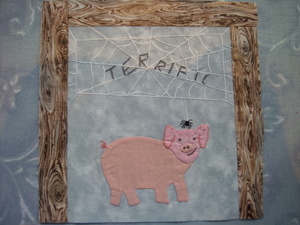 This is the Charlotte's Web block that I was working on for my guild. The guild was asked by our local hospice center to make a children's quilt. I am part of the committee and decided to do a truck block for Ryan and this one for Chloe. I forgot to get a photo of the truck block, but I'll get one eventually. It's going to be a great quilt filled with the sorts of stuff that kids like. 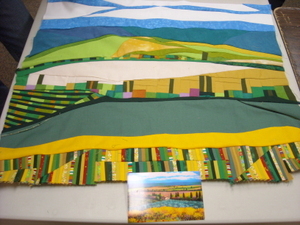 When it's finished it will hang in the hospice center's meeting room. 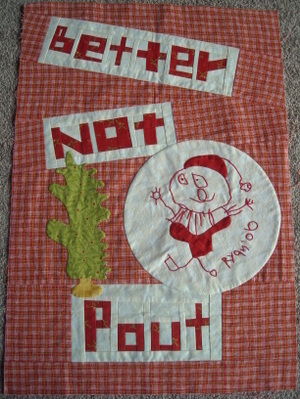 I finally made some progress on Better Not Pout! 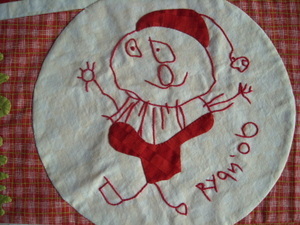 Yesterday I embroidered the lines on Ryan's drawing of Santa. I really like how this came out. I decided to embroider through the two layers of fabric and I like how it stayed flat, with no bunching from the embroidery. I'm trying to decide what to do next with this. Do you think it would be good with a plain border or a pieced border? I really think it needs something, just not sure what. You can put this next one into the "Kathy made me do it" category. 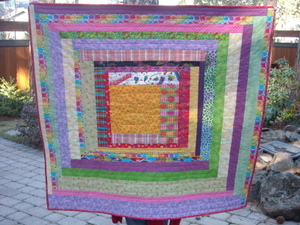 Last week I was enjoying her blog and saw her adorable Sugar and Spice quilt. I had seen the Bento Box pattern before, but hadn't given it a whole lot of thought until I saw it there. In addition to that I've been thinking about making a quilt for my oldest nephew who is about to graduate from high school. This pattern seems tailor made for him and I had a stash of blues I've been wanting to use up. 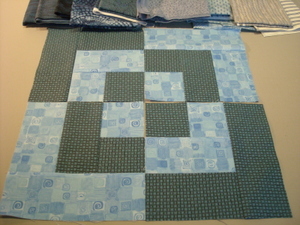 By necessity this quilt won't be as charming as Kathy's because of the more subdued colors, but this block couldn't be simpler to put together and works great with fat quarters. I don't have the Bento Box pattern, just figured it out from looking at the photos online. 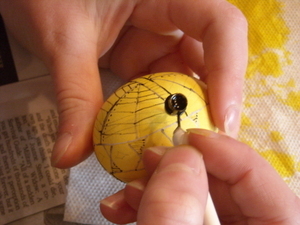 It seems a little strange to work on something so precise after all the free piecing I've been doing lately. I discovered that it takes me about a half hour to put together a four block set and that means there's a real sense of accomplishment even if I can only get into the studio for a short time. I'm well on my way to having enough for a quilt top. And, I'm finally using up the blues that I hardly ever go to. I'm not sure why that is, I wear blue all the time. I'm showing this photo just because it seems like a tradition now to pose Scrabble on the ripple blanket whenever he gets groomed. Here's the handsome boy and the blanket looks pretty good too. 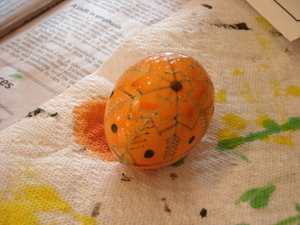 I want to make it longer, but it had gotten down to having only autumn colors in the basket. I bought a few brights to lighten it up and I'm still working on it sporadically. I do get it out often to snuggle under even though it's not finished. Is that weird? Today was my last day of radiation! What a relief to have all the hard stuff over. Actually, radiation wasn't bad at all. I came to see it as a quiet spot in the day. I'd go and sit and knit while waiting, then close my eyes and relax for a few minutes during treatment. The skin reaction isn't too bad either. Tomorrow, I start taking an aromatase inhibitor which is a long term medication. My hair is growing out now. Sometimes I wear a baseball cap and my friends have seen me without a hat. I'm not quite ready to go completely hatless in public, but I'm getting there. Life goes on and if I didn't have this darn cold we'd be out celebrating tonight. Hopefully we'll get a chance to do it this weekend. I had another great class at the Stitchin' Post. This time it was a surface design play day. There were several stations with various media we could play around with. I forgot to take any photos at the class, I was too busy playing! However, it was fun and a good time to play with someone else's stuff. 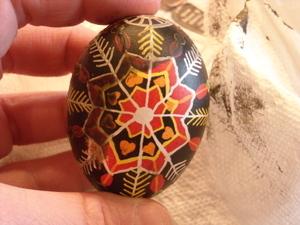 First I did some stamping with Jacquard Lumiere paints. I really liked the effect with these and it was easy. Click on the photo to get a better view. These are all various stamps used with the paint. Then I tried discharging with bleach. This technique is obviously going to take some time and practice to get any good at. I did enjoy using a laundry bleach pen to make words and shapes. 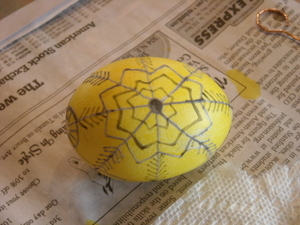 Some of the other participants got much better results with the stencils. I need to do a bit of research before trying this at home, but I can see the possiblities. 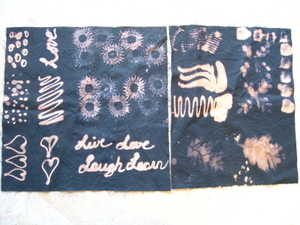 On the left I used the bleach pen to make various squiggles, dots, circles, hearts and words. 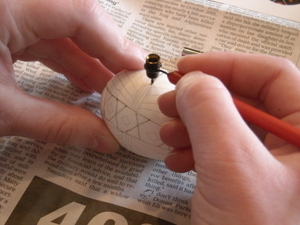 The round sort of "gear" shape is make with a rubber stamp. 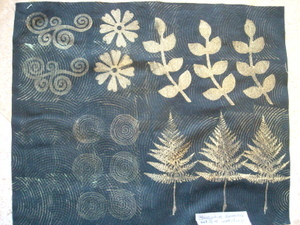 On the right I used a square piece of sponge, a hair pick, the bleach pen, stencilled leaves and another rubber stamp. I also enjoyed playing around with Shiva Paintstiks again. These are nice to use and have wonderful colors. I used different rubbing plates and a dot stencil. These last two are with techniques that are not really my style. The pink flower was done with Neocolor II watercolor crayons. 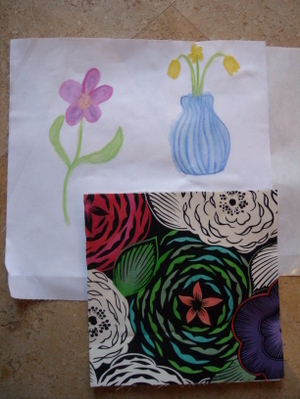 and the vase was done with Prismacolor watercolor pencils. I think that both of these techniques may produce something that is not machine washable. I need to read more about that. 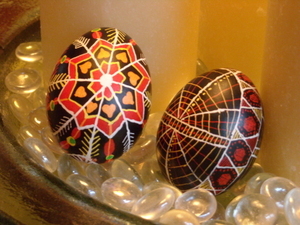 The bottom one is a lovely cream and black print fabric that was colored in with Tsukineko Inks. I like the effect, but it's not something I see myself getting into. All in all, it was a good class. 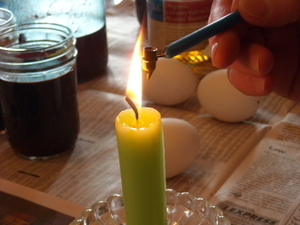 I'm glad I got the chance to try out the Lumiere paints because I've been wondering about them. I'm also glad I tried the bleach techniques. Looking back I wish I'd spent more time experimenting with the bleach. I think my favorite part is creating new texture on a piece of fabric. Really making it your own would be wonderful. I know there are many more possibilities out there for changing a fabric's surface and I've marvelled at batik and hand dyed fabrics. Perhaps some day. Right now I can hardly keep up with all the stuff I've already got going. 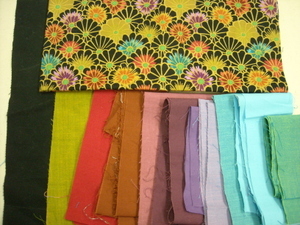 I've been doing some sewing that I really want to share, so look for that in the coming days. 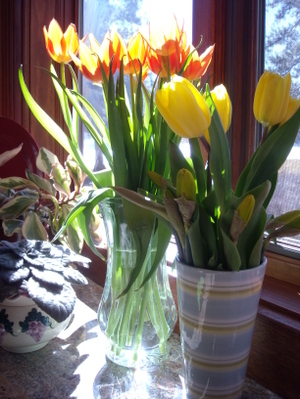 It kinda, sorta feels like spring here, but I just know it's going to be short lived. We've got days in the 50's and nights in the 20's. Spring is a long time coming here in the High Desert. As for me, I'm not taking any chances. Knitting continues as usual. I've started several new things. I took a look at my yarn stash and felt a bit overwhelmed. Especially with the bin of bits and bobs, the stuff I always say I'll use up some how. Stash busting, that's what it is! 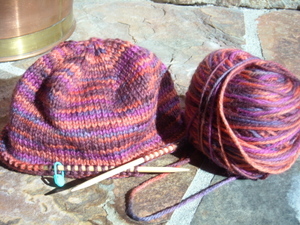 First I thought I'd use this yarn to make a Thorpe hat. 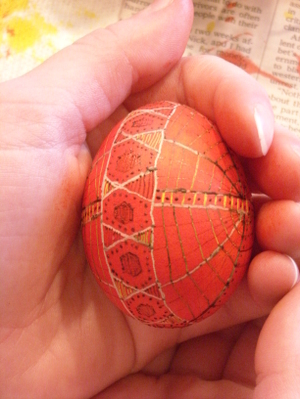 It actually came out rather big, but I like the pattern and I'm already making a second one. 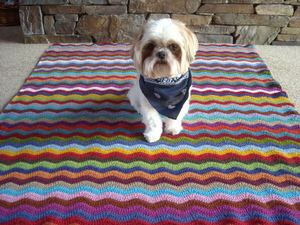 This is made from some beautiful yarn I got for free at the Blue Moon Sock Camp last year. There was one point when Tina just had a bunch of small balls of various kinds of yarn on the table and said we could take what we wanted. I got several balls of this stuff, which was just enough for this hat. This will be donated to charity at some point. 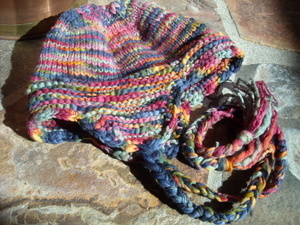 Here's the second one made with Lorna's Laces Shepherd Worsted. This is a skein I picked up on sale one time and then realized I didn't like the colorway so much (I seem to do that a lot!). 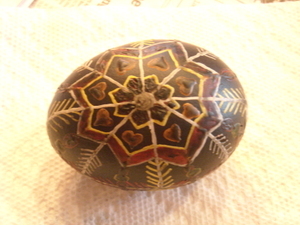 This one is more like a small child's size so will be a gift or maybe for charity. I think there will be a stash of hats by the time I'm done! I've been working on these i-pod cases ever since Chloe got her new one for her birthday. I was making Ryan one with the Kureyon like Chloe's when he politely informed me that he preferred red and he went and found this beautiful Manos in the stash. Perfect! I just need to get these felted. 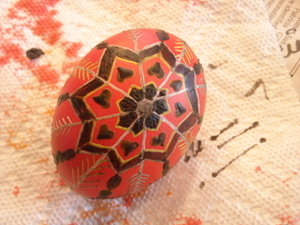 This is my own pattern. Rogue's hood is coming along nicely. 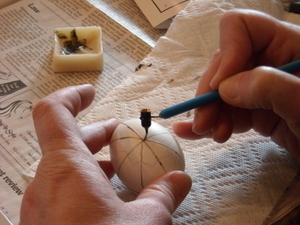 This one takes a lot of concentration for me and close attention to the charts, so I work on it sporadically. I started this EZ February Baby Sweater which I had been thinking of for a while as a good use of this Jaeger Extra Fine Merino. 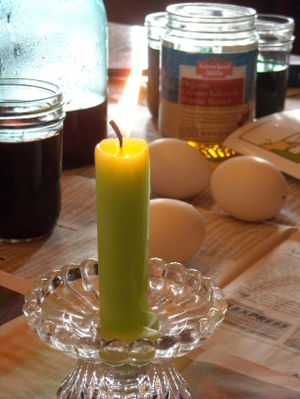 it's working up beautifully. I just love EZ's patterns and books. 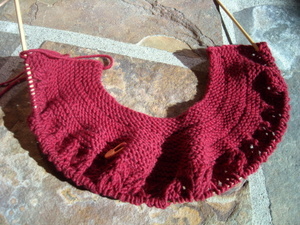 I also started a Tomten Jacket, but forgot to take photos. Lastly, here's the plain vanilla sock I've been carrying every where I go. This is Dream in Color Smooshy. It's my favorite green color and was an impulse purchase a few weeks ago. 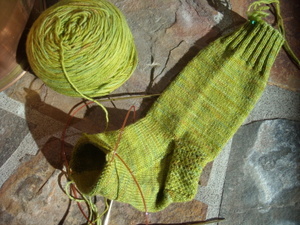 This is a very basic sock on 64 stitches with an eye of partridge heel. I love how fast these simple socks go. I've got to stick to simple so I can make a dent in the sock yarn stash! We went back for a little follow-up session last week and what an array of gorgeous works in progress! 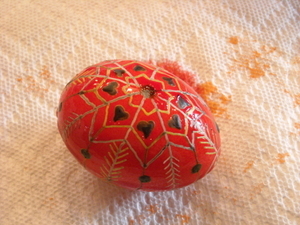 Mine, above, is not as far along as I would have liked and not nearly as complicated as the others. 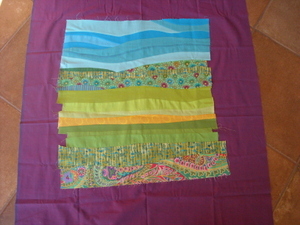 I do have a plan to finish this part as a quilt with no binding and stitch it to the top of another quilt made with Kaffe Fassett's grape shot cotton. This colorway of shot cotton is truly amazing. They are all wonderful, but this color just glows. This technique is one that Jean uses a lot and is featured in one of her newest books, Portraits from Nature. 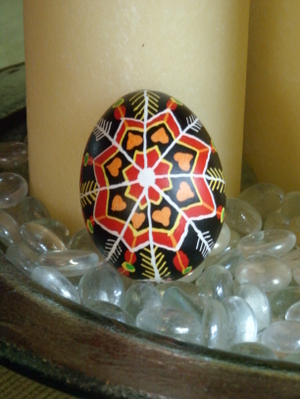 You can take a look at my previous post to see how I took this idea from a greeting card. Here are some of the other works done by students in the class. This first one is amazing. All those stripes are pieced! This one is being done by one of the Stitchin' Post employees and will be in their featured quilts at the Sisters Quilt Show this July. 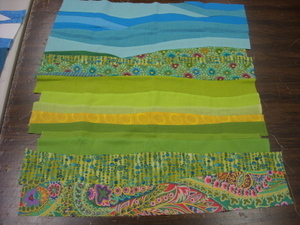 I love how she took that print fabric and separated out the colors just as Jean did in the example from the class. This one is done in the dimensional nature that I want to do mine. Jean showed us how to hand sew the top quilt (here, the four patch block) to the back quilt so that it seems to be floating. The student had originally sewn the edges directly on to the backing, but it doesn't look good that way. To make it look like it's floating you would hand sew about 1/2 to 1 inch from the edge of the top quilt's backing to the under quilt. 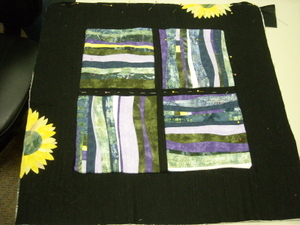 The appliqued sunflowers really add something to the composition. 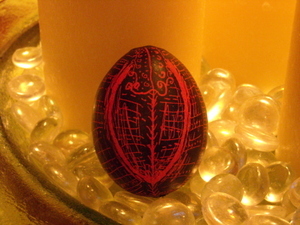 I also attempted to define a colorway by using one of Kaffe's prints. I had thought about working on this, but I've just got too much going on right now. I hope to work this way sometime in the future. Lastly, we were treated to a look at a shopping session that Jean was having with the representative of Westminster Fibers. Have you ever seen anything so luscious! 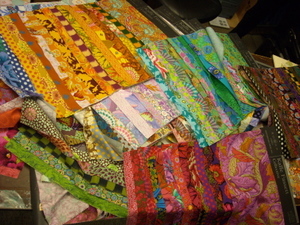 These are the fabric samples for the Kaffe Fassett collection which includes other designers. These samples come in colorways with lovely names. I just wanted to take these home. Every colorway he brought out was more beautiful than the last. Jean is thinking about getting these samples when the distrubutor is done with them and hanging them in the store. I think that's a great idea because there's so much inspiration here. 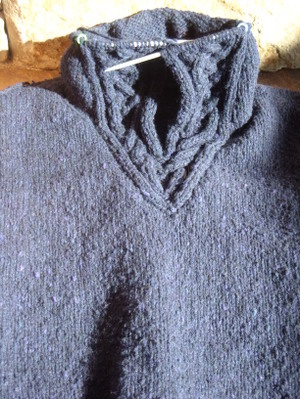 Well, that's all for now, but how about next time I do a knitting update! 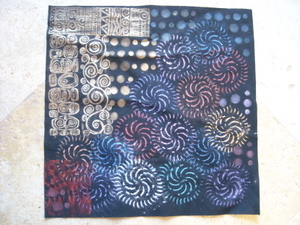 After that I'll have a report on another class I'm doing with Jean Wells called Surface Design Play Day. Well, I'm not sure really what the difference is between crumbs and strings, except that to me, it seems like crumbs should be smaller. 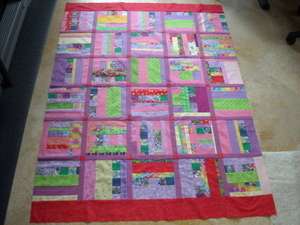 I think the quilt with the red sashing in the previous post probably ought to be called a string quilt. 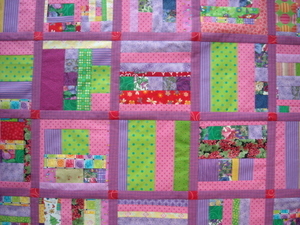 Anyhoo, I finally got this string quilt, above, done yesterday. I put the top together many months ago, as well as a pieced back. 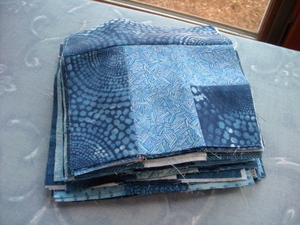 All I had to do was some simple straight line machine quilting and a binding and it was good to go. 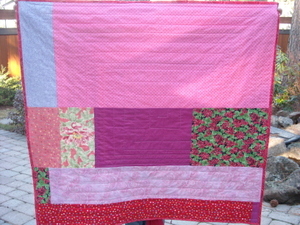 My mom asked me recently if I had a baby girl quilt she could give to some friends of theirs. I'm not sure if she'll like this one, but I've got other possible quilts as well as a completed baby surprise jacket that would be perfect. I also am getting ready to put this one together (crumbs or strings???) 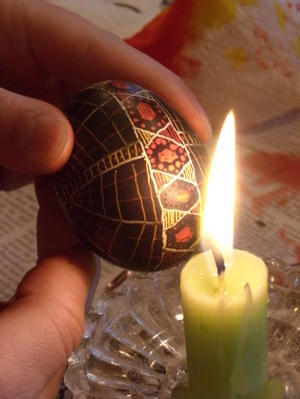 with sashing and intersecting squares. 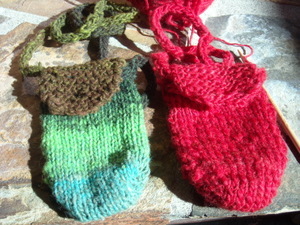 These were also finished several months ago and sitting in my drawer. I confess I'll be really, really glad when all this over-the-top pink is out of my stash. I'm not crazy about these colors. I've been knitting as well on my plain vanilla sock, a Thorpe hat, an Elizabeth Zimmermann February baby sweater and Rogue. I can't seem to stick to one thing, but you knew that already! Next up, I'll be giving you an update of that Jean Wells class. We had a follow up class and the work was just awesome.